Born as a division of Adeo Group, Adeo Screen has transformed the production of screens into a fine art. As testified by its vast range of models: tensioned and with a rigid frame (such as Frame), motorised and hand-rolled, (with winch); with spring and tripod – culminating in their most innovative products, such as Multiformato. The choice is really ample, including a wealth of projection surfaces and numerous format options (from the classics: 4:3 and 16:9). But the Italian brand Adeo Screen distinguishes itself above all through its ability to ensure complete customer satisfaction. Thanks to its PSS (Personal Screen System) the company is able to provide personalised, made to measure screens, while remaining consistent with geometric rules and quality standards. 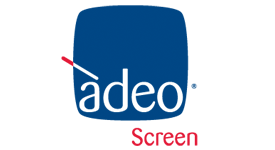 Whatever your needs, home cinema or professional applications, Adeo Screen always offers the best possible solution. An art that starts in Trento, Italy, and reaches the whole world.